To those we had the privilege of speaking with, we look forward to continuing to discuss how we can meet your development and testing needs. To those who missed us or were unable to attend this year's show we invite you to join us next year, but urge you to not wait until then to discover how our customized testing and formulations services can meet your needs. 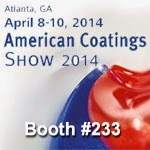 Visit us today at www.avomeen.com/coatings or call 800.930.5450 to speak directly with one of our Ph.D. chemists. Thank you to everyone who joined us at this year's American Coatings SHOW to discover the best ways to innovate and provide premium products to the marketplace.